New Jersey Transit’s North Jersey Coast Line begins to the north at either New York Penn Station or the Hoboken Terminal in New Jersey. It runs straight through Belmar along the Jersey Shore, ending four stops south of Belmar at the Bay Head station. It is a commuter train that runs for 65 miles, averaging 24,900 riders per day along its 28 stops. There are between 2,300 and 4,300 series trains on weekdays and between 4,700 and 7,300 on weekends and major holidays. The first train heading north from Belmar to New York departs at 5:06 a.m. and arrives at Newark Penn Station at 6:32 a.m. From there, you can get to the World Trade Center by 7:03 a.m. via the PATH train, the World Financial Center at 7:08 a.m. by way of the Hoboken Ferry, or New York Penn Station at 7:02 a.m. by continuing on the North Jersey Coast Line. The total trip time from Belmar to New York Penn Station is one hour and 56 minutes. The quickest morning train from Belmar to New York Penn Station is one hour and 46 minutes. That one leaves at 6:01 a.m. from Belmar. 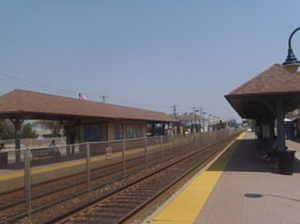 Morning trains also leave Belmar heading north at 5:23 a.m., 6:14 a.m., 6:44 a.m., 7:11 a.m., 8:04 a.m., 8:45 a.m. Non-rush hour trains depart from Belmar at 10:27 a.m., 11:27 a.m., 1:27 p.m., 2:22 p.m., 4:21 p.m. Belmar departures in the evening are at 6:04 p.m., 7:33 p.m., 8:46 p.m., 10:00 p.m., 11:06 p.m., and 11:52 p.m. 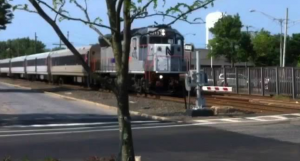 Trains coming to Belmar from New York and other northern locations arrive at 7:43 a.m., 9:04 a.m., 9:45 a.m., 11:47 a.m., 12:45 p.m., 2:45 p.m., 4:01 p.m., and 5:33 p.m. The trains come more regularly during the evening commute with arrivals to Belmar at 6:23 p.m., 6:49 p.m., 7:14 p.m., 7:50 p.m., 8:05 p.m. The late night arrivals are at 9:02 p.m., 10:19 p.m., 11:38 p.m., 12:27 a.m., 1:21 a.m., and 3 a.m. The rate for an adult traveling one way from Belmar is $16.75 and the price is $7.65 for seniors, children, and people with disabilities. Weekly fares are available for $146 and a monthly pass is $480 for an adult or $360 for students. A pass for ten trips is also available for $167.50, which is the same per-ticket price as a regular ticket. Other discounted tickets are available for group sales and various museums and performances in the region. Children are free on weekends and holidays, and discount fares are available for military personal and their families. As is true for much of New Jersey’s infrastructure, Hurricane Sandy did not spare the North Jersey Shore Line. It took about three weeks for the line to begin running again after the storm. Track was washed out in several places where it runs closest to the Atlantic Ocean. Boats and floating containers hit the drawbridges at Raritan Bay and Morgan Creek, knocking the tracks out of alignment. The storm hit October 29 and 30 in 2012, and service was restored starting November 19.